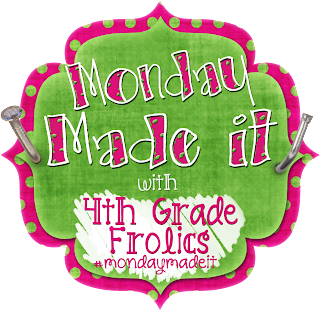 I am finally starting my list of things I want to make for my classroom so I am linking up today to Monday Made It with 4th Grade Frolics. My first little project was a magnet board to hang in my room. The white boards in my classroom aren't magnetic so I was excited to find this idea on Pinterest. 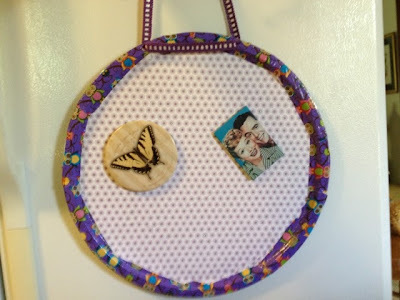 This is just a pizza pan from the dollar tree covered with scrapbook paper and duck tape around the edges. I then had my dad drill me two holes in the top so I could put ribbon through it and hang it up! The next thing I did was simply paint some wooden frames with purple glitter paint. These frames were on sale at Michael's for .79! They are light even that I will be able to tack them on my bulletin board and put book recommendations from my students in them. The picture below is an idea of how the bulletin board will look when it's being used. I'm also going to have students actually write out why they recommend those books. It will be like an extra credit bulletin board and each week three new students will get to hang up their book recommendations. I'm also starting to create my own lesson plan book. One of the first pages on the inside will be a page I created based on the book Teach Like a Pirate. It is just a sheet that gives me ideas for activities I can use in each lesson to help my students become more engaged. I don't mind sharing this document, however it didn't show up as pretty when I imported into Google Drive. If you would like to take a look anyway, you can find it here. This will really help me as I start to Plan like a Pirate. 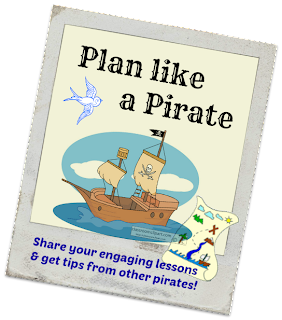 If you are getting a head start to lesson plans for next year, link up with me below. Also, don't forget to go visit 4th Grade Frolics to find out what everyone else is making!